A modular life cycle organizes a flow of events into logical pieces that you can easily reorder, reuse, or refactor. You can use stages, processes, and steps in Case Designer to create a modular life cycle for a case. By capturing events in a structured way, you can make changes to your designs that are quick and effective. The following case type illustrates how you can incorporate modularity into a life cycle. 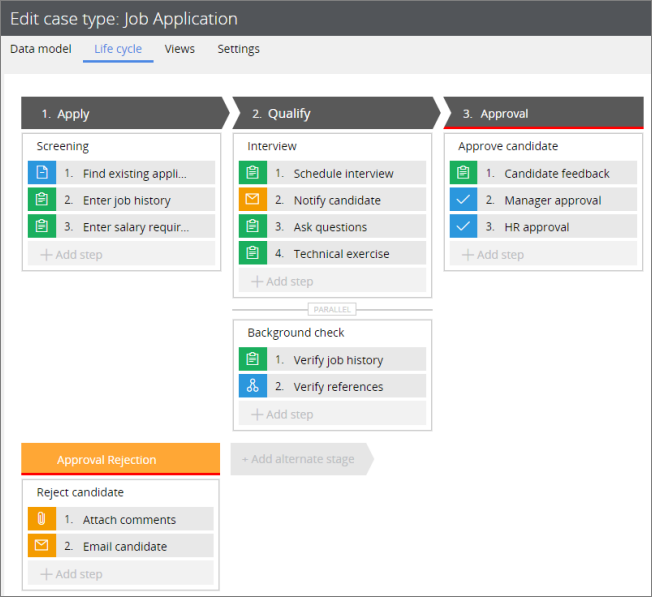 In the Job Application case type, it is easy to reorder and reuse steps because they are grouped into relevant processes. For example, you can reuse the Interview process in the Approval stage to ensure that qualified candidates go through an additional round of interviews. You can also move the Background check process to a step in the Screening process so that personal information is retrieved only when the job history is relevant to the open position. Because you can control how many steps are within each process, the number of underlying flows that are created in your application is dramatically reduced. To gain a better sense of this improvement, compare the number and types of flows that are generated for the Interview process in Pega 7.1.9 with the single flow that is generated in Pega 7.2. When considering how to create a modular life cycle for a new case type, start by adding stages and processes. You can then refine each process by adding steps. For more information about the different types of steps that are supported, see Steps in the life cycle of a case.